It’s hard to do Camus justice in any real sense. Such is the nature of existential and psychologically-driven works such as this (or Kafka, etc). 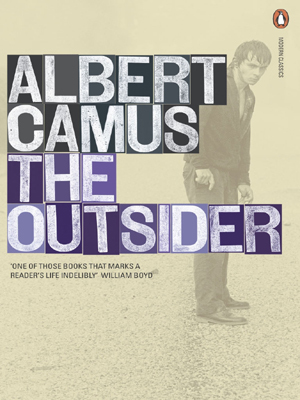 I hadn’t read Camus since high school, at a time when I was voraciously devouring anything I could get my hands on, so Lorenzo’s pick of ‘The Outsider’ (or ‘The Stranger’, depending on which edition you have) arrived with a bit of nostalgic reflection. This is a touchstone novel for sure, but in terms of proper appreciation I think I honestly prefer ‘The Plague’ a little more than this one. Those of us that take exception to the status quo often find we have to tread lightly in order to avoid the consequences that even the fiercest of assholes seem to somehow elude. Such is life in this age of internet warriors, armchair experts, instant access to short form information and a cultural polarity that is unprecedented in our time. So be it. We get through it. Let’s use another quote to sum up, this time Lebowski: “The dude abides”. Yep. We abide. Anyway…Camus is never a particularly ‘enjoyable’ read, but that isn’t necessarily the point. Some authors are more about the message than the tale. Or maybe a better way to put it would be ‘the destination is more important than the journey’. I think the Liquorature collective would agree. They read, discussed and have moved on. I honestly don’t think this book has been mentioned again since this night. Having said that, deep subject matter requires deep drinks for intellectual lubrication. A couple of vintage Glenrothes and an older Bruichladdich were solid accompaniment. I’m not normally a fan of post ’70s ‘Rothes, but rather enjoyed these two. And Bruichladdich is usually in my wheelhouse. This one I was definitely keen on. Oh yeah, and finally…it’s never bad having an Italian cook dinner for you. Just saying. Helluva good gnocchi, Lo. Well done, mate. Randoms: Gnocchi and caperberries … “can we go smoke the skunk?”… the minivan.